These are some elevators that I’ve photographed in the last couple of years that are no longer standing. 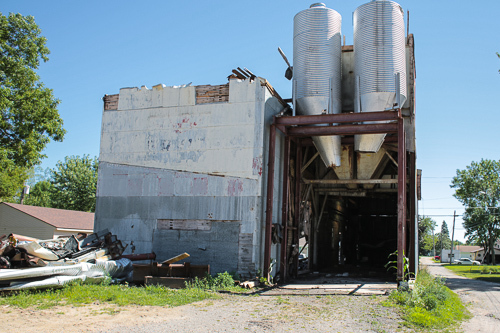 One of the reasons I photograph agricultural related subjects such as barns, graineries, corn cribs, elevators, old machinery and so forth is to document disappearing way of life. Simple progress has led to the demise of some of the things I photograph. Whether the progress was technical improvements such that the old method or machine was no longer viable in the face of improved technology or a change in economics which made certain new things feasible and certain old methods or ways unfeasible. 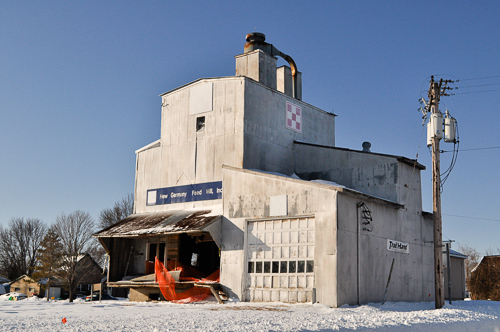 The small town grain elevator was once an activity center and employer in many small towns. Economics have made these small elevators unable to cope in today’s environment. Today elevators are much larger and located in close proximity to rail lines. While progress does what progress does best – progresses, the loss of an employer in a small town is never good and in many cases pushes the town one more step on the journey from the self contained, self sufficient communities that they once were, to the bedroom community with only a bar and convenience store that they are apparently destined to become. 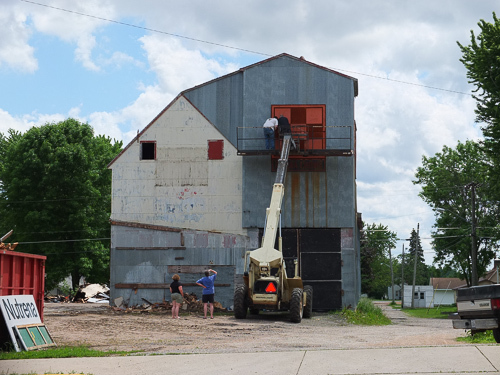 This entry was posted in Uncategorized and tagged abandoned, copyright ryan ware, elevator, grain elevator, new germany mn. Bookmark the permalink. I know exactly what you mean, Ryan, and so appreciate that you, like me, appreciate these businesses and buildings that center/once centered our small towns. It’s sad seeing elevators crumbling. Where we used to live in Montana, the elevator that used to be the center of activity in the town just 10 years ago now sits empty. Luckily, where we are now in SE Minnesota, small town agriculture is still alive and well. Thanks for commenting Kathy. Glad to hear that your town is doing well. BTW, your blog looks great. I’m going to check it out more in depth first chance I get.